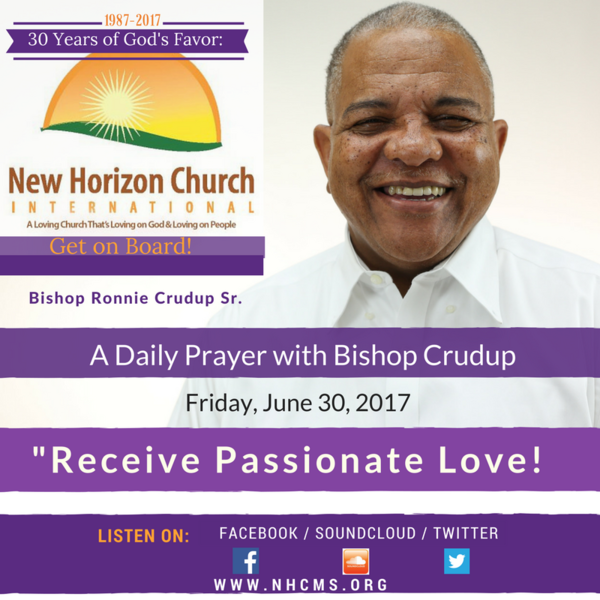 It's the last day of the month, Friday, June 30, 2017, and for today's A Daily Prayer With Bishop Crudup, Bishop prays, "Receive Passionate Love!" Tuesday, March 14, 2017, A Daily Prayer With Bishop Crudup "Amazing Grace Today!" Wednesday, March 15, 2017, A Daily Prayer With Bishop Crudup "Touch Them With Love!" Wednesday, April 19, 2017, A Daily Prayer With Bishop Crudup, "Release Favor Lord!"